Often, as it pertains to gaming, computer use and our health, it is easy to focus on hand, wrist, forearm and shoulder issues. Though maintaining proper upper extremity health is absolutely essential, it is also important not to overlook our lower extremity health. Depending on the circumstances of their injury, I will often have gamers and computer users, who come for a patient evaluation, sit at the office desk; which allows me to evaluate not only their posture, but also the placement of their legs, which can at the end of the day, eventually effect one’s hand, wrist and upper extremity health. Simply put, if you find yourself sitting incorrectly, or in a position that puts strain on your calves, hips and lower back, the tightness and pain that comes with this can eventually transition to your shoulders, arms and upper extremities. In previous articles and videos, we have discussed the upper extremity in some detail; however, in this article, I will be focusing on maintaining lower extremity health while using the computer, which in turn, will also lead to a healthy and balanced upper extremity. One of the most serious injuries, or conditions that I often discuss with gamers is DVT, or “Deep Vein Thrombosis”. Essentially, a DVT is a blood clot in the calf, or lower extremity, which is caused by any issue that prevents proper circulation or by countless hours of immobility. Another possible contributing factor is dehydration. Poor leg positioning for extended periods of sitting may also affect posture, spinal health and circulation. The list above does not contain all of the risk factors, however, these are some of the risk factors for DVT. Individuals suffering from DVT can experience swelling of one or both legs, leg pain, soreness or cramping, skin discoloration and at the end of the day this can lead to a multitude of life and limb threatening complications. It should also be noted that individuals who develop DVT can also have cardiac & pulmonary issues. At the end of the day, sitting in these positions is not ergonomically balanced, and can have long-term effects on your spinal alignment, circulation and posture. On that note, make sure to avoid these positions for prolonged periods. Understandably, the incorrect positions shown previously can FEEL more comfortable, as they don’t engage your core, and can correlate more to a slumbering, lounging or slouching position, but at the end of the day, they may cause long term complications. Now that we’ve established correct foot/leg placement, I’d like to talk about foot/leg exercises that you should be doing EVERY hour while gaming. As we’ve discussed, you should always take AT LEAST a 5-minute break every hour to perform hand, wrist and upper extremity exercises and stretches, as well as the following leg exercises. This will hopefully optimize your health, while allowing you to game for longer periods of time. Heel Raise/Calf Squeeze: Simply place your feet flat on the ground, then, push downward with your toes, which should elevate and flex your calves. These are quite similar to a calf raise you would do in the gym; but, they can be done from a seated position. Perform this for: 3 sets of 10 and hold for 5 seconds on each repetition. 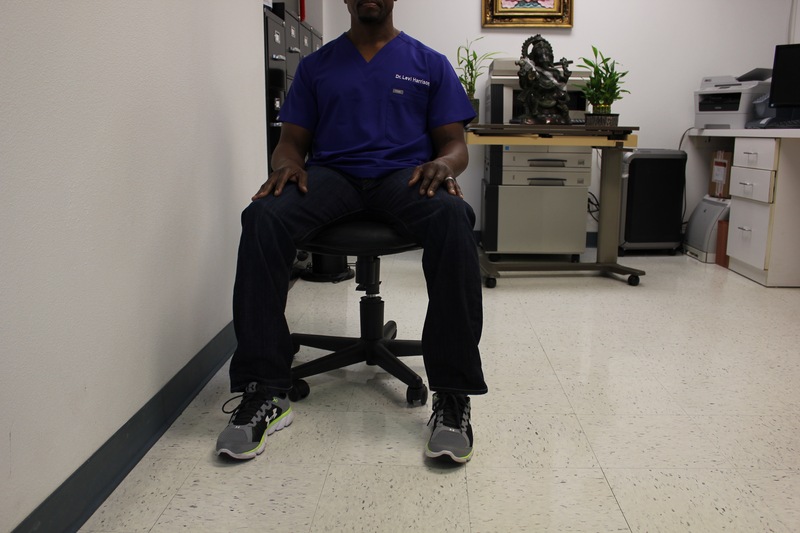 Ankle rotation exercises: From a sitting, or standing position (Make sure you can maintain balance if standing), lift each leg individually then rotate each ankle clockwise, then counter clockwise. Perform this for: 3 sets of 10 in each direction. Foot Raises: With your feet flat on the floor, lift your toes/foot upward, while keeping your heels on the floor. Perform this for: 3 sets of 10 and hold for 5 seconds on each repetition. Simply Standing/Walking: Be sure to simply stand and walk for at least 1-2 minutes for every 90 minutes of computer use. I would also suggest these exercises should be done when on a plane or in car for an extended flight or trip. These exercises, in conjunction with proper hydration, and sequential hourly breaks are essential to not only maintaining your health, but also extending your gaming or computer-centric career! Again, I would like to sincerely thank you all for your perpetual support! I hope this article will assist you in maintaining comprehensive, overall health! If you have any questions or comments regarding any of the positions, please reference the video embedded above! Peace and health! Game on! © 2019 Dr. Levi Harrison. All Rights Reserved.